After coming in an impressive second in his 2004 bid for the United States Senate in Georgia, Herman soon became the host of his own radio talk show, “The Herman Cain Show,” on Atlanta’s WSB 750 AM/ 95.5 FM. Today, as a former Republican candidate for the Presidency and seasoned business leader, he remains an active and outspoken voice for conservative issues. In January 2013, Herman began the next phase of his life’s journey with the start of the nationally syndicated Herman Cain Show, heard on many radio stations from 9 – noon daily. 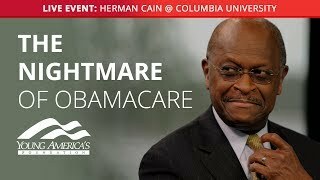 To complement the radio show, Herman also established www.hermancain.com which offers a constant flow of commentary, news, audio, video, humor, and reader/listener interaction, and www.cainradioraw.com which offers the radio show on demand and without commercials. Then, with the help and success of The Herman Cain Show, WSB Radio was honored with the distinction of being the 2015 National Association of Broadcasters’ (NAB) Marconi Award Winner for News/Talk Station of the Year.